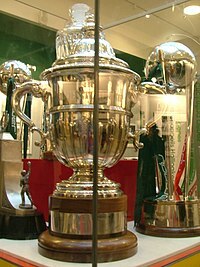 The inaugural Cricket World Cup was hosted in 1975 by England, the only nation able to put forward the resources to stage an event of such magnitude at that time. The 1975 tournament started on June 7. The first three events were held in England and officially known as the Prudential Cup after the sponsors Prudential plc. The matches consisted of 60 six-ball overs per team, played during the daytime in traditional form, with the players wearing cricket whites and using red cricket balls. The 1983 event was hosted by England for a third consecutive time. By this time, Sri Lanka had become a Test-playing nation, and Zimbabwe qualified through the ICC Trophy. A fielding circle was introduced, 30 yards (27 m) away from the stumps. Four fieldsmen needed to be inside it at all times. India, an outsider quoted at 66-1 to win by bookmakers before the competition began, were crowned champions after upsetting the West Indies by 43 runs in the final. The 1987 tournament, named the Reliance World Cup after their Indian sponsors, was held in India and Pakistan, the first time that the competition was held outside England. The games were reduced from 60 to 50 overs per innings, the current standard, because of the shorter daylight hours in the Indian subcontinent compared with England's summer. Australia won the championship by defeating England by 7 runs in the final, the closest margin in World Cup final history. The 1996 championship was held in the Indian subcontinent for a second time, with the inclusion of Sri Lanka as host for some of its group stage matches. In the semi-final, Sri Lanka, heading towards a crushing victory over India at Eden Gardens (Calcutta) after their hosts lost eight wickets while scoring 120 runs in pursuit of 254, were awarded victory by default after riots broke out in protest against the Indian performance. Sri Lanka went on to win their maiden championship by defeating Australia by seven wickets in the final, which was held in Lahore. In 1999 the event was hosted by England, with some matches also being held in Scotland, Ireland, Wales and the Netherlands. Australia qualified for the semi-finals after reaching their target in their Super 6 match against South Africa off the final over of the match. They then proceeded to the final with a tied match in the semi-final (also against South Africa) where a mix-up between South African batsmen Lance Klusener and Allan Donald saw Donald drop his bat and stranded mid-pitch to be run out. In the final, Australia dismissed Pakistan for 132 and then reached the target in less than 20 overs, with eight wickets in hand. 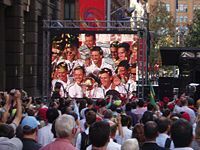 A large crowd of over 10,000 fans welcome the Australian team on completing the first World Cup hat-trick - Martin Place, Sydney. In 2007 the tournament was hosted by the West Indies. The Cricket World Cup became the world tournament to be hosted on all six populated continents. Bangladesh progressed to the second round for the first time, after defeating India, and they later went on to defeat South Africa in the second round. Ireland making their World Cup debut tied with Zimbabwe and defeated Pakistan to progress to the second round, where they went on to defeat Bangladesh Following their defeat to Ireland, the Pakistani coach Bob Woolmer was found dead in his hotel room. The cause of death was heart failure, Australia defeated Sri Lanka in the final by 53 runs (D/L), extending their undefeated run in the World Cup to 29 matches and winning three straight World Cups. ↑ "The History of World Cup's". cricworld.com. Retrieved 2006-09-19. ↑ "ICC Trophy - A brief history". cricinfo.com. Retrieved 2006-08-29. ↑ "Cricket World Cup 2003". A.Srinivas. Archived from the original on 2009-10-25. Retrieved 2007-01-28. ↑ "1996 Semi-final scoreboard". cricketfundas. Retrieved 2007-01-28. ↑ "1999 Cricket World Cup". nrich.maths. Retrieved 2007-01-28. ↑ "Ruthless Aussies lift World Cup". London: bbc.co.uk. 2003-03-23. Retrieved 2007-01-29. ↑ "Full tournament schedule". London: BBC. 2003-03-23. Retrieved 2007-02-22. ↑ "Previous Tournaments". ICC. Archived from the original on October 16, 2007. Retrieved 2007-05-06. ↑ "Bangladesh braced for rampant Australia". newindpress.com. 31 March 2007. Retrieved 2008-07-26. ↑ "Ireland ranked tenth in LG ICC ODI Championship". ICC. 2007-04-22. Retrieved 2007-05-06. ↑ "Bob Woolmer investigation round-up". Cricinfo. Retrieved 2007-05-06. ↑ "Australia v Sri Lanka, World Cup final, Barbados". Cricinfo. 2007-04-28. Retrieved 2007-05-06.